Either way to the “REAL” alcoholic or addict this kind of meeting means “OD”! When A.A. was very successful, that is 50% – 75% recovery rates, the folks who did the talking in meetings were recovered alcoholics. The suffering and untreated alcoholics listened. After hearing what it takes to recover, the newcomer was faced with a decision; “Are you going to take the Steps and recover or are you going to get back out there and finish the job?” If they said they “were willing to go to any length,” they were given a sponsor, a Big Book and began the process of recovery by taking the Steps and experiencing the Promises that result from that course of action. This process kept the newcomer involved in working with others and continued the growth of our Fellowship. Today we have the meeting format known as the “Open Discussion” Meeting or “OD” on your meetings list. This is time set aside for for drunk-a-logs, a discussion of our problems, ideas and opinions or “my day” or “my way.” Recovery rates are less than 10% in the rooms today! It would appear that we have permitted newcomers to convince the old-timers that they have a better idea. They had just spent 30 or more days in a treatment facility where they had been impressed with the need to talk about their problems in Group Therapy Sessions. They had been told that it didn’t make any difference what their real problem was; A.A. had the “best program.” They were told that they should go to an A. A. meeting every day for the first 90 days out of treatment. They were told that they shouldn’t make any major decisions for the first year of their sobriety. And what they were told goes on and on, most of which are contrary to the program of Alcoholics Anonymous! Apparently, what they were told sounded pretty good to the A.A. members who were here when the Treatment Center clients started showing up at our meetings. A group cannot take on the personal problems of its members–the primary responsibility for the solutions of all their problems of living and growing rest squarely upon the individual themselves. Should a group attempt this sort of help, its effectiveness and energies would be hopelessly dissipated. Sobriety — FREEDOM from the obsessive thoughts, compulsive feelings, and physical cravings that ruled our lives, through the teaching and practice of the Twelve Steps, is the SOLE PURPOSE of the group. If we don’t stick to this cardinal principal, we shall almost certainly collapse, and if we collapse, we can’t help anyone. Question – Should we take a stand in meetings of this type and speak out against it? Do these types of “open discussion” groups have any business or right to call this type of meeting a 12 step program? Should we actively commence to change these types of meeting formats or should we just leave our group and go start another meeting that is about working the 12 steps to recovery? We’d love to hear your comments! First, thanks for your article. I never appreciate miss-quotes and I don’t have a copy of As Bill Sees It handy, but a similar (if not the same) quote is in the pamphlet Problems Other Then Alcohol and the quote is "Sobriety — freedom from alcohol, through the teaching and practice of the Twelve Steps, is the sole purpose of an AA group." If you’re going to quote it, quote it correctly. Taking things out of context and misquoting is part of how we water down the message in the first place. There is a whole lot of difference between what you wrote and what Bill wrote and I am still not sure I got it exactly right. Admittedly the difference has nothing to do with your topic. Personally I don’t go to OD meetings, and I don’t like for the people I sponsor to go to them either. But this isn’t because there is something wrong with an Open Discussion; it is because of what we have allowed them to turn into. Like you said, they often become group therapy sessions, but without the qualified therapist. And, I am not suggesting we invite one! If a group of recovered alcoholics or addicts who are working the program in our text were to have an OD meeting the message would likely be consistent with our text. The problem isn’t OD meetings. The problem is that people think they have a right to come into AA, follow none of the AA program, but still talk about how they did it in an AA meeting. Pardon me, but if you don’t need the program to recover then maybe you’re not even a real alcoholic, and even if you are GO START YOUR ON DAMN FELLOWSHIP! Call it BB, or whatever you want. Don’t come to AA and share your BB solution and call it AA, and expect me to roll over and say "patience and tolerance". You might as well let the garbage man open a heart clinic, and prescribe Hefty bags over Glad to get your cholesterol down! You see people in AA act like AA isn’t something specific, and it IS! It is a very specific program with very detailed directions! It does not serve us to have group therapy sessions and label them AA meetings and stick them in the When and Where. Group therapy is a very valuable tool for treating all kinds of problems that people go through. Go have as much group therapy as you like — just stop calling it AA. come from? I have a little background in statistics, so which is it? 50%? or 75%? And where is the rest of the data to go with this? There’s three types of lies: black lies, white lies, and statistics.
?" Is that the type of activism that is in question here? From page 91: "Tell him enough about your drinking habits, symptoms, and experiences to encourage him to speak of himself. If he wishes to talk, let him do so. From page 92: "Don’t, at this stage, refer to this book, unless he has seen it and wishes to discuss it." From page 95: "Unless your friend wants to talk further about himself, do not wear out your welcome. Give him a chance to think it over. If you do stay, let him steer the conversation in any direction he likes. Sometimes a new man is anxious to proceed at once. And you may be tempted to let him do so. This is sometimes a mistake. If he has trouble later, he is likely to say you rushed him. You will be most successful with alcoholics if you do not exhibit any passion for crusade or reform. Never talk down to an alcoholic from any moral or spiritual hilltop; simply lay out the kit of spiritual tools for his inspection. Show him how they worked with you. Offer him friendship and fellowship. Groups have a structure; they have business meetings to discuss changes like this. If someone wants to go into the business meeting and have a dialogue about this in that context, fine and dandy. But going into a conventional meeting, disrupting it or bombarding it with sarcasm and judgments is both disrespectful, arrogant, and more to the point, doesn’t serve anyone. But then maybe that’s why some folks don’t like to go past page 88. Therefore, the main problem of the alcoholic centers in his mind, rather than in his body. There is a solution. I try to just speak from my experience, as I see it today, and from the Big Book, then just hold my tongue and listen as I get bludgeon to a bloody pulp by many nasty words, and challenges to everything I say, and misquotes and mis-readings from the BB…. YOU CAN NEVER RECOVER.. YOU WILL DRINK.. YOU ARE STILL SICK SICK SICK… YOU WILL ALWAYS BE SICK and RECOVERING… (hum? this is not what Bill W. said.) I do not fight with them, because I WAS one of them… Had no clue how far off course had gone…. "It’s very simple.. they don’t want to do it .. you cannot change that. You told the truth and that’s all is required of you. Someone in that room needed to hear the truth and you did your job. You will never convince anyone who is in denial about their true motives .. because they still lie to themselves .. how can you explain the color blue to a blind man — You don’t do the steps — You still lie to yourself .. simple. The vigor with which they defend their malaise is indicative of the fear the process holds for them .. it’s the lot of every person who walks through the doors. Pray for them." There is a great article on this blog about sobriety statistics from the old days – http://www.bigbooksponsorship.org/blog/index.cfm/2007/7/14/Sobriety-Statistics-12-step-recovery-rates – have look for yourself. I have worked with over 200 alcoholics and addicts of the hopeless variety since June 2005 and 52% of them are currently sober (I know this because I keep track of them). Finally, when it comes to taking a stand, I have stood up and "smashed it out them" at meetings creating a ruckus and even have had people verbally and physically threaten me. (My least favorite approach – Dr. Bob from "Dr. Bob and the Good Oldtimers" would say, He didn’t like to upset drunks – he felt it could cause them to relapse.) I have started new meetings – big book sponsorship formats both within a particular fellowship and I have even joined other fellowships such as, A.A. C.A., N.A., and A.A.A. (I don’t really go to N.A. meetings anymore – they are too frothy, group-therapy oriented – truly "open disgusting"). P.S. When I "muck" someone through the Big Book – I cover the first 164 pages. Kurt, lets quote the book in context. The passages you quoted are from Chapter Seven and it is what we do on a Twelve Step Call – the lost art of Alcoholics Anonymous. Keep reading a little bit and you will see that it also indicates that we don’t even invite them to AA unless they (and we) are sure they are alcoholic and want a spiritual solution to their problem. When they are ready and we are on our second visit to a man which is still before their first AA meeting, but the prospect is ready to make a decision STEP THREE and tell his story STEP FIVE! Again, context, context, context. Part of the problem is we all read the book and say well, this is what it means to me. Well, if you have the mind of a chronic alcoholic WHO CARES WHAT IT MEANS TO YOU! The only thing that matters is what did it mean to the first 100 who said it was an accurate reflection of how they recovered from alcoholism in a time when such a thing was said to be impossible. The authors point of view is the only one that matters. Lets read and try to understand their point of view. This is exactly why I love Joe and Charlie. They really try to present an accurate account of the Book from the point of view of What were these people trying to convey to us rather than this is our opinion about it. Do they share their opinion, yes they do, but they keep their opinions to a minimum and try to present the book without their ego. Please listen over at http://aaprimarypurpose.org/speakers.htm and scroll down the page to The Big Book Comes Alive, Joe McQ. and Charlie P.
Forward to the second edition Of those who came to AA and really tried, 50% got sober at once and remained that way; 25% sobered up after some relapse, and among the remainder, those who stayed on with A.A. showed improvement. So I buy your concerns about context. My selection of quotes, to me, wasn’t out of context in a traditional AA discussion meeting we don’t know where each person is or whether they’re ready, so those paragraphs, as I see it, apply. And, God knows, trying to apply a 1934 context to a 2008 AA group is bound to be difficult to say nothing of troubling. Context is everything its big — and no one is arguing that doing the steps are not vital. And I love Joe and Charlie myself. Seen em once, loved em, listened to them for hours and hours and hours. Joe used to bring me to tears. All good things. Now about those statistics & what I’d like to see are the data for how many clean and sober people, who have done all the steps, who actually practice those principles in all their affairs. For myself, those are the people I would listen carefully to (although they are not likely to be the same people that create the ruckus or smashed it out them). For myself, Id like to see a little more steel-on-steel rather than proselytization. That’s the test of the quality of ones sobriety not whether you got it being mucked or not mucked. We both know for a fact that sobriety – for those that really want it can be obtained in either format. But lets see how its practiced. Frankly, around here anyway, some of the ruckus is so loud, I can’t hear the words. It is impossible to control the masses, so why try. Let God do that after all isn’t that his job anyway? As for speaking out isn’t that just being selfish and trying to impose our own views against the masses? When faced with insurmountable odds, it is our job to shine, stand tall and be of the utmost example to those who need to see that. For those who wish to spread their own view of what this program is, I say let them, but do not prevent those who need to seek out the help and are willing to go to any lengths, not have the option to choose for themselves which path to take. In other words, Yes, open up other meetings as it is our responsibility to carry this message. One more thing, a hard user can pretend to be an addict but an addict definitely cannot pretend to be a hard user, because a hard user can stop without the Grace of God. I like what Frank C’s sponsor told him. When I share at a meeting, "OD" or not, I share my experience, which is until I plunged into the steps right away, I continued to relapse. I also try to keep my opinions checked at the door. The program is built on attraction. If by sharing my experience helps one member in that room I am batting 1000.I am personally starting a twelve step workshop in the South Florida area based on the AAA criteria, which of course is strictly out of the Big Book. This will be my little contribution to the question posed in this article. Personally, getting into heated battles either for what I think is the good of AA, or at home with my wife, causes resentment. We all know where that can lead. OD meetings are here to stay. I attend them, sometimes, and when someone goes off about a broken phone, or the traffic sucked, etc… I try to be tolerant. I admit that what I really want to do is shout "SHUT UP! ", but I show restraint I believe that in a way, that is actually helping my sobriety. Here here! The voice of tolerance and reasoned moderation. What you do, Bruce (from where I sit) is more than help your sobriety — you practice the principles — you walk the talk. Busting into some group’s meeting and launching a lecture about how they’ve got it all wrong isn’t walking the talk. That’s zealotry. For the record, I don’t support "Busting into some group’s meeting and launching a lecture about how they’ve got it all wrong…." I have done it, and it wasn’t good for me or any one else. 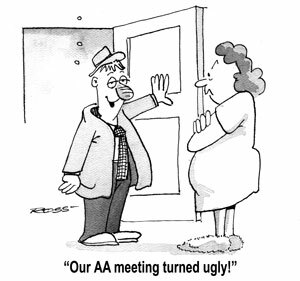 I also believe AA would be dull if all meetings were Big Book meetings and Back To Basics type meetings. I think there is room for all (Do I get points for "reasoned moderation" now? ), but I will not stop being responsible for carrying THE message. And I voice my opinion quite openly as you know outside of meetings. I try to stick to the book and my experience within. Just this past week a newcomer in his third week of sobriety attends week one of our beginners meeting http://www.backtothebook.org and the next day his therapist tells him to go to 90 in 90, going through the steps within 6 weeks of sobriety is too fast, and he should go to meetings where he can share (read – open discussion meetings). I guess she is just too lazy to run a group therapy session, or maybe the insurance just won’t cover it. But she sent him to AA for it. I don’t expect that she cares as much about the success of AA as I do. Not to worry though, I had the newcomer fully briefed on the AA folklore. I am generally fair and honest about the fact that what we do is not main stream, and there are plenty of other opinions and approaches to the AA program. I point out though that what we are going to do is right out of the book, and his chances of success are far greater because of this fact. In the end it all really depends on how desperate he is for a solution and how willing he is to apply the steps fully. Bruce, I am in South Florida and we are doing some exciting things in my neck of the woods. http://www.backtothebook.org will get you in contact with our group. We are an AA group in Sunrise Florida. I can see where this can be confusing. The pages you quoted are talking about making a 12 step call on somebody who does not know about AA and have not yet self diagnosed. It is meant to break the ice and to let the prospect know that we have been there and we offer a solution. At this stage the prospect only has a drunk-a-log to share.